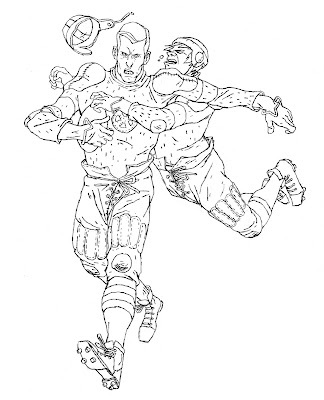 Colossus and Cannonball playing old-timey football. 'Cause in my mind, fancy private schools like the Xavier Institute still use old-timey uniforms. As a kid, certain X-titles had a lot of appeal to me, 'cause they were about otherwise normal kids living at a cool boarding school with powers and drama and whatnot. That Harry Potter appeal. The books have lost that over the years. OH, and a few of people were asking about process. See below. All of these images should enlarge to actual size when you click 'em. Once I've thought of what it is I want to draw, even before doing a sketch, I browse around online and in my library for scrap. In this case, I looked through a bunch of old (pre 1930) football photos for ideas about uniforms, shoes, poses, etc. And because they're pretty much awesome. Once I feel informed (or get tired of looking), I start sketching. I quickly doodle out a dozen or so little possibilities and then pick the one I like. I liked this one above. 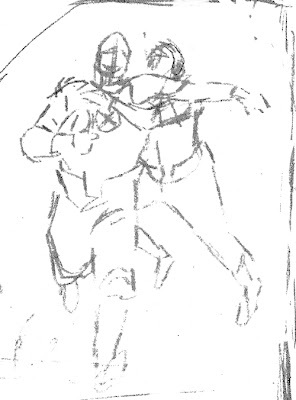 The actual sketch is around two inches tall. I make a drawing based on the sketch. 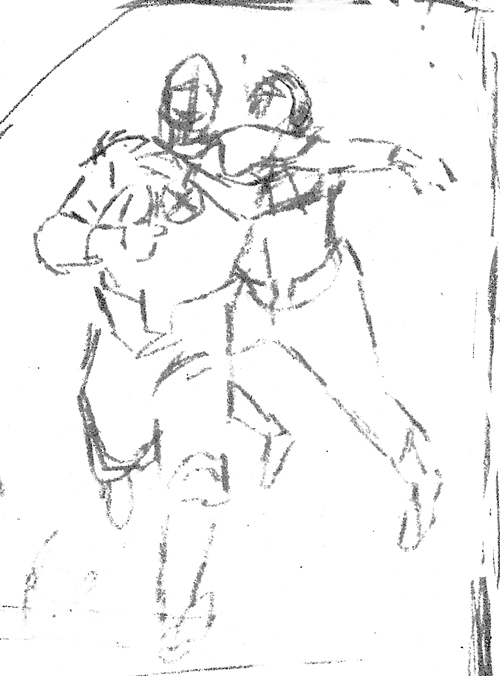 Sometimes I enlarge the sketch and draw over that, sometimes I don't. In this instance I enlarged the sketch, drew over it with blue pencil and then did the final drawing in 4b mechanical pencil on top of that. I isolate my pencils in photoshop using the channels functions. I color under the lines in photoshop. Nothing fancy. For client work I'd have already picked my colors and done a study, but for this kind of stuff I just wing it. I keep my colors flat and simple. Sometimes I color my lines, too, by locking the transparency of my pencils layer and going over them with the desired color, like I did on Colossus's sweater. Here I've thrown down a layer of scanned watercolor texture I made with india ink wash. It's an overlay layer under the lines and over the color, set as a clipping mask. 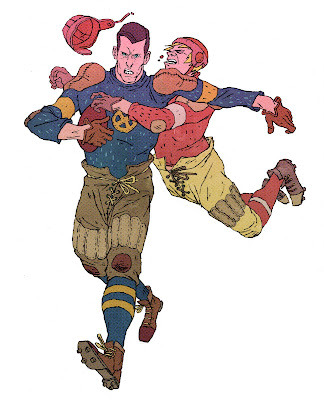 I duplicate my color layer and throw the color halftone filter on it. That's right. I use a FILTER. And I'm not ashamed. Then I isolate the dots with the channels and drop the opacity. 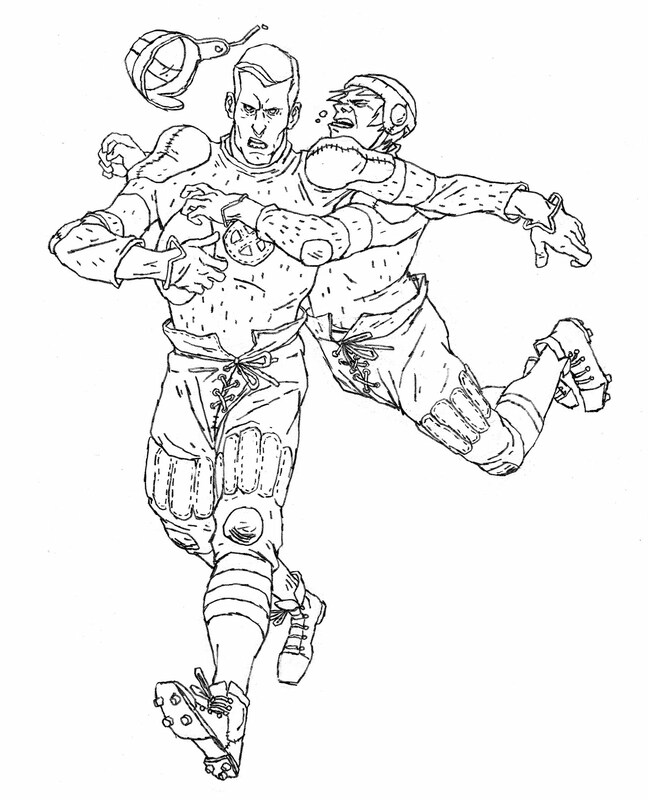 And another overlay layer. Gradient. Pink. I cut out of it to make sure Colossus's eyes are blue, and check over everything one more time. Hope you folks enjoyed the drawin' and the shop talk. I'm always hesitant to do anything at all on process because what I do is SOOO SIMPLE. I do not think I could be more basic if I tried. Great to see the process. And how did you know that Cannonball was my favorite x-men character? If only he wasn't getting rammed in the face. Oh my goodness, I've been waiting years for someone to explain all this! Thanks so much Jake, you can't believe how helpful this is for me. Oh Jake, I like so much the things you draw, even if I'm soooo slow in catching up updates. I'm in awe of your sense of space and your angles. Thank you. Very cool. Love process posts. I love your drawings, no matter how "basic". These X Men are great! you got class in that process man no matter how simple it is. the end results are sweet. Really nice work Jake. Colors and forms are great. And thanks for sharing process. I like hearing what others do with PS layers to get quick results.